They have a great wine list, mostly Argentinian, as well as very interesting cocktails. The first one I tried was La Recoleta that is a neighborhood in Buenos Aires, made with Los Haroldos, an extra brut Argentinian sparkling wine and Saint Germain elderflower blossoms liqueur. The second one was more creative and with an interesting saltiness: El Gibson, made with Nolet's Silver gin, Carpano dry Vermouth, served chilled with house made pickled onions. I could not resist ordering the Trio de Chorizo Caseros, composed of pork sausage, blood sausage and red spanish chorizo, the later being my favorite. This is a must have that I order each time I go there with friends, and, if you love sausages, you will not be disappointed. 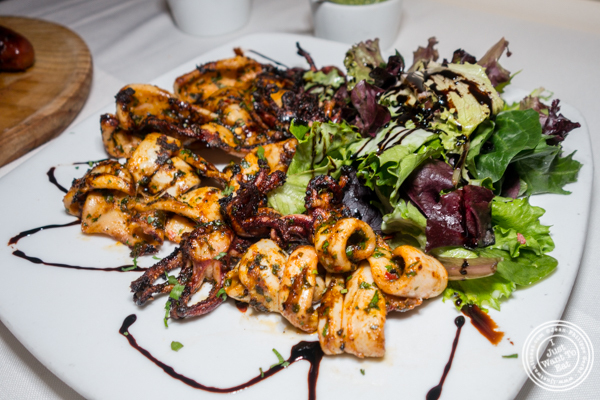 The second appetizer was Calamarares a la parrilla or grilled spicy calamari served with baby field greens in a citrus vinaigrette drizzled with a balsamic reduction. This was great: the calamari was perfectly cooked, not rubbery with a nice char and I loved the balsamic reduction that gave a nice acidity to the dish. But the plat de resistance was the long awaited ribeye and seeing Chef Carlos showing that beautiful 32 day wet aged piece of meat, I could hear angels singing next to me! This 26 to 28oz ribeye is comes from Uruguay. It is cut and then sealed air tight in its juice, for 28 days trip by boat and 4 days in customs, amounting to 32 days of wet aging, giving the meat some extra juiciness. The meat was very good: juicy, with nice grill marks, tender and quite flavorful, it was simply brushed with olive oil and a mix of oregano, paprika and parsley. As sides, there were the sublime French fries, slightly crispy and cooked all the way though, seasoned with garlic and parsley, and the asparagus with citrus vinaigrette (alright, I admit that I ate more fries than asparagus...). Last was dessert and it was a new one that I tried there, their panqueque de manzana and torre de arroz con leche being superb. This time, it was Bunuelos de Bananas or ripe bananas deep fried in batter served with a scoop of vanilla ice cream and served with honey. This is probably the best fried banana dessert I had in a long time! Not heavy, the bananas were perfectly ripe and it was dipped in honey. With dessert, they offered a sweet wine, a Susana Balbo Late Harvest Malbec 2016 from Argentina. This was delightfully sweet and perfect with the fried bananas. What a meal! In the past 6 months, I went several times to Chimichurri Grill and I have never been disappointed. The food is consistently delicious and it is always a pleasure to see Chef Carlos who has a true passion for his cuisine. bet it will not be the last time I will dine there and I definitely recommend this place.